The Neapolitan Mastiff (or Mastino) is often in the top of many categories. These giants are of the largest of dog breeds, the most protective of canines, and often winners of ugliest dog competitions-- the beastly, grotesque look of the Neo is meant to send trespassers away on their heels. They are not friendly towards strangers, are not the best choice for other pets and are not hypoallergenic. Mastinos are, however, easy to groom and exercise plus very loving and loyal to their owner or family. 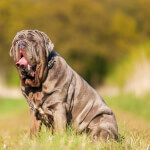 You will never forget the folds and wrinkles, drool and lumbering run of a Neapolitan Mastiff! Intelligence- Mastino's posess average intelligence and are independent thinkers that may be difficult for first time owners to train. They require a firm, pack leader- type owner or they run the risk of becoming overly aggressive and protective. Kids, Strangers, Other Pets- The Neo does best as a single pet and may be territorial towards other dogs. Many owners report with early socialization they can do ok with other household pets. This breed will remain reserved around strangers, even if well trained. They are natural guard dogs and will attack if necessary. They are loving and protective towards children of their household but may not be friendly towards unfamiliar kids-- plus they pose an accidental hazard due to their large size. Exercise- Anyone who has seen a Neapolitan Mastiff running (or lumbering, as some call it) knows that graceful, they are not. The breed is not very active and a few short walks per day will keep them happy. 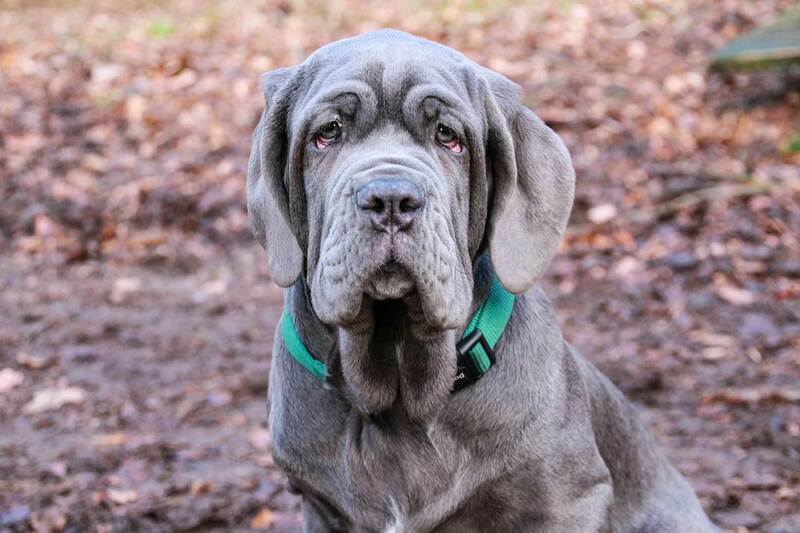 Neapolitan Mastiff history may begin as early as 3,000 B.C. when ancestors of the breed (Molosser dogs of Asia, the Middle East and Northern Africa) were fearsome war dogs. Alexander the Great introduced his Mastiff type dogs to Greece in the 300 B.C. and these war dogs were later adopted by the Romans when they conquered the area. 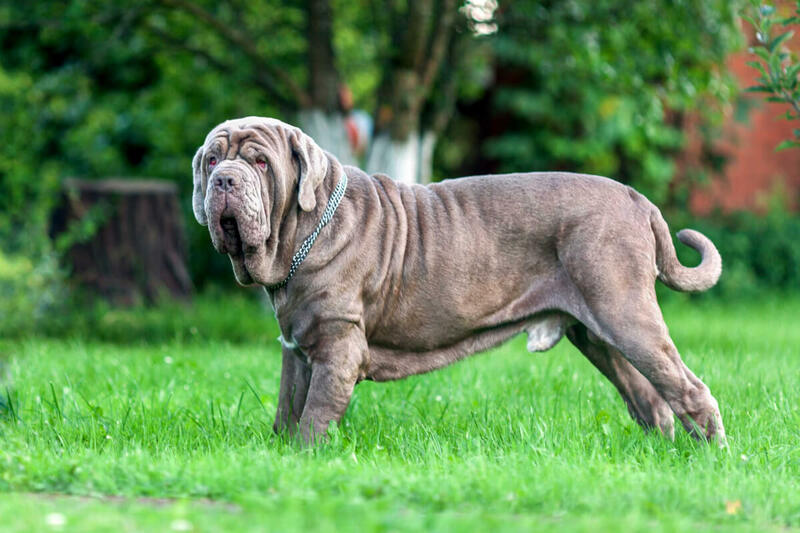 Upon invasion of England by the Romans, these already massive beasts bred with English Mastiffs to create the earliest versions and origins of the Neapolitan Mastiff. Throughout their history there are few animals the breed didn't fight-- lions, tigers, elephants, jaguars, bulls, and men. They even fought for spectacle in the Roman arenas just as the gladiators did. As civilization advanced, the breed thrived in the Neapolitan region of Italy as guardians of owners, their families and their properties. Although the population nearly went extinct by the end of WWII the breed was still alive and well in Campania, Italy. Then, in 1946, the breed made it's first appearance at a dog show in Naples. Shortly after (1948) Dr. Piero Scanzioni presented the first breed standard and FCI acceptance followed the year after. The AKC did not recognize the breed until 2004 and in between this these times the standard was rewritten more than once. 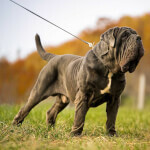 Although not extremely popular in the U.S. today's Neapolitan Mastiff is a loyal, steady guard dog with a loving nature. Mastinos are gigantic, wrinkly beasts that look exactly like a guard dog aught to-- formidable and imposing. The abundance of skin, hanging in folds, might make one wonder if there is a smaller dog inside simply wearing a dog suit way too big for him! However, the penetrating stare will leave you with no question you are dealing with a calculating and powerful dog. The head, itself, is very large and covered with folds and wrinkles. The lips are pendulous (hanging) and there is a significant dewlap. The eyes are amber or brown but you may not be able to make them out under the drooping upper lids; the lower lids are droopy too. Neapolitan Mastiffs often sport cropped ears but naturally they are medium sized, triangular and hanging. Overall, the body is visibly longer than tall with a broad, deep chest and muscular, thick boned legs. The coat is short, dense and smooth and is standard in four colors: blue, black, mahogany and tawny. The tail is thick and tapering but is usually docked to 1/3 length. 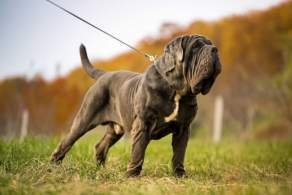 The Blue Neapolitan Mastiff seems to be the most popular, followed by the black. 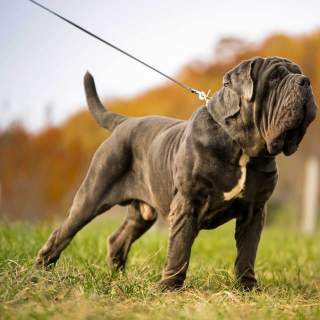 All coats can be varying shades of the colors mentioned above and can include tan brindling (considered a marking)-- for instance, a tawny Neapolitan Mastiff or mahogany Neapolitan Mastiff can be brindle but in this breed there are no individuals solely referred to as a "brindle" Neapolitan Mastiff. The AKC also states that white markings are allowed "on the chest, throat-area from the chin to chest,underside of the body, penissheath, backs of the pasterns, and on the toes." Yes, yes we know the question on every potential owner's mind, "How big will they get?". Well, a fully grown Neapolitan Mastiff size places them firmly into the "extra large" dog category. These are some of the largest dogs in the world along with the Mastiff and Great Dane, Bernese Mountain Dog and Great Pyrenees. Neapolitan Mastiff weight, on average, is 110 pounds for females and 150 pounds for males, however, the breed standard states that these dogs often exceed these averages and it is preferable for them to be bigger! They usually stand 24-29 inches at the shoulder if female, 26-31 if male (putting them right around 2.5-3 feet not including the head). Potential owners certainly want to ensure they have enough space for such a dog. 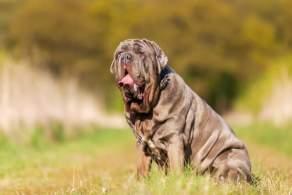 There are no alternate sizes considered as breeds of Neapolitan Mastiffs. These big, huge, GIGANTIC dogs come in the sizes of, um, big and bigger. The largest Neapolitan Mastiffs can weigh over 150 pounds! 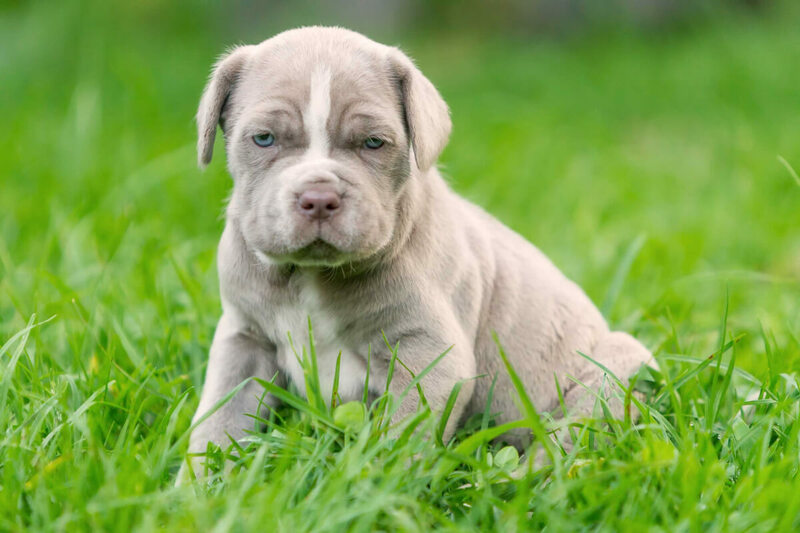 Any breeder advertising Miniature Neapolitan Mastiffs is likely crossing them with a smaller, similar looking breed, therefore, you probably won't find a purebred Mini Mastino. Beware of hoaxes involving photoshopped pictures of Mastinos to look like 8 foot tall monsters-- while the breed is huge and imposing, they often weigh 100-150 pounds and aren't much taller than 2-2.5 ft' at shoulder height. The Neapolitan Mastiff temperament makes for a very unique guard dog. They are watchful and protective but you won't hear them bark often. This breed is very calm and sweet with their family and enjoy being around the household; they are often loving to children in their pack. They are not aggressive towards strangers unless the situation calls for it (i.e. someone is trespassing on your property or breaking into your home) and are said to be calm yet watchful; a well trained one knows when to stand imposingly and scare away a stranger vs when to attack. It's worth mentioning these dogs need no training to be protective and will do so with their lives, if necessary. On the flipside of this, a poorly trained Neapolitan Mastiff can have a personality that is overprotective and aggressive. This is a danger to children that wander into its territory or appear to be fighting with children of its family. These independent thinkers can be rather a lot of dog to handle for an inexperienced owner because it is imperative they get early and firm training as the "leader of the pack"-- lest they become a liability. This breed can be ok with other pets (usually) with early socialization but it is best if they live in a single pet household. Mastinos and children is a difficult subject. On one hand, these dogs love their families and will be calm, sweet and protective to children of the family. 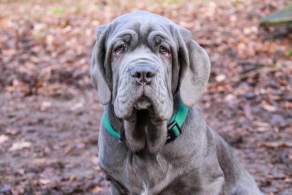 They should always be supervised, however, because even a baby Neapolitan Mastiff is quite large and poses an accidental knocking over hazard to a small child. On the other hand, these dogs can be jealous if children of the house get much more attention than them. Then there's the whole aspect of NM being wary of visitors-- which also applies to visiting children. If your Mastino isn't socialized to the top notch levels, he/she may be aggressive towards strange children if they are seen in any way as "threatening" to your children-- even in fun and games. 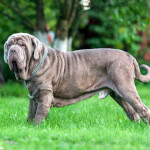 The Neapolitan Mastiff is a horse of a dog! Not only are they big but also tend to be territorial and jealous towards other dogs. Many owners say they can get along with other pets ok if trained and socialized with them from puppy age but they may not ever be the best of friends. This dog is recommended as an only pet, if possible. 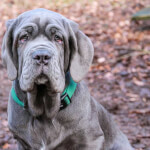 Below are pictures and images of the Neapolitan Mastiff. 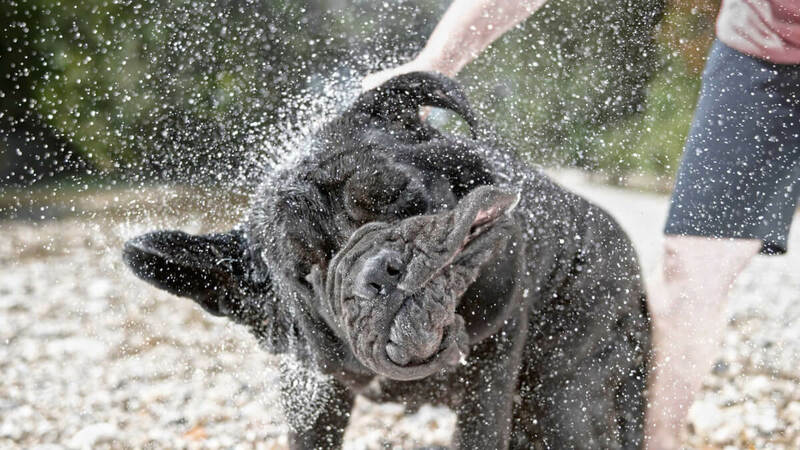 Owning a Neapolitan Mastiff is a responsibility not recommended for first time owners. They require a firm, alpha-type experienced owner. Early socialization and training is a MUST if you have frequent visitors or live in an apartment building-- speaking of apartments, you may want to see if the breed is even allowed at yours! These dogs do not bark often at all. A large living space and fenced yard is not necessary for these low energy watchdogs. However, if you choose to let them outdoors unattended to stretch their legs, it should be in your own fenced area as they may not be stranger friendly-- for this same reason, walks should also be leashed. If you have a large property in a rural area without close neighbors, this is a breed you can let out without a fence because they tend to stick close to home. Finally, although they are pretty low maintenance, it's important to note that Neapolitan Mastiffs are not "hypoallergenic". In addition to normal shedding there will be PLENTY of drool ropes swinging from their pendulous lips. If cleanliness is your thing-- consider another breed. Eye problems are common and the most common one is Cherry Eye, although they are also known to have Entropion and Ectropion. Some of these issues such as Cherry Eye and Bloat are more common than the others. It should be noted the breed is especially susceptible to the Leishmania parasite. Your puppy may develop several or none of these issues and we provide them for your reference. We recommend choosing a reputable breeder that offers health certifications for the parents, at least. Routine veterinary visits are also a must to detect certain health issues early.